The entrance lobby of the Physics Department contains a Foucault pendulum and stunning floor design. In 1851, French physicist Jean Leon Foucault designed a revolutionary experiment which demonstrates that the Earth is a rotating body. His apparatus was rather simple; a 28 kg mass on a 67 m long wire which was attached to the ceiling of the dome of the Panthéon in Paris in such a way that allowed the pendulum to swing freely in any direction. Foucault found that the plane of oscillation rotated in a clockwise direction, as viewed from above, at a rate of approximately 11 degrees per hour, and one full 360 degree rotation of this plane took 32.7 hours. Click on the equations to see what they represent. The floor display was designed by Professor Sandra Chapman, Warwick Professor of Physics, and NESTA Dreamtime Fellow (2003/4). The surface of the Earth is a rotating reference frame. This means that when we do mechanics on the surface of the Earth we need to take account of additional “imaginary” forces which would not be there if we did the calculations standing still in space. One of these imaginary forces is called the Coriolis force. In the northern hemisphere, this causes travelling objects to undergo an apparent deflection west when travelling south, and east when travelling north, as viewed from a point on the Earth’s surface. 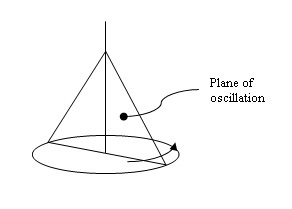 So the plane of oscillation for our pendulum rotates clockwise, as viewed from above. The latitude of Warwick University is φ = 52° 22’ 48”. Using this, it is found that the time taken for the plane of oscillation to rotate through 360° is T = 24 hours / sin φ = 30.3 hours. At the North Pole, φ = 90° so T = 24 hours. At the equator, φ = 0° so T → ∞ (the plane of oscillation doesn’t rotate). The radial yellow lines on the floor display show the angle through which the plane of oscillation rotates every hour, which is 11.9°. Click here for a detailed derivation of the equations used to obtain these results. 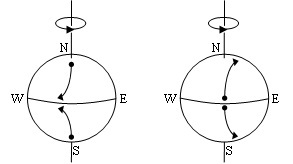 Four compass points are included in the display, but they have no direct connection to the pendulum motion or radial lines. Magnetic compass readings are unreliable in the lobby because of the residual fields left by the large NMR magnets in the nearby laboratories. On the wall are two paintings inspired by COBE maps of the texture of the early universe: http://aether.lbl.gov/www/projects/cobe/COBE_Home/DMR_Images.html and are an attempt to capture the multifractal nature of turbulent expansion. These works are a collaboration between Alan Parker (Leverhulme Artist in Residence, 2003/4) and Sandra Chapman (Warwick Professor of Physics, and NESTA Dreamtime Fellow, 2003/4). The Cosmic Dreamtime - Universe is inspired by all sky images in microwave light. These images capture the earliest moments in the Universe, before the formation of stars, planets, and life itself. The earth colours echo aboriginal dreamtime paintings. This work is an attempt to convey a multifractal, a mathematical prescription for patterns that are ubiquitous in nature. The Cosmic Dreamtime - Man asks about our place in the Universe. Floating in unformed space, the figure is the intersection between body and spirit, mind and matter. It reaches out to embrace the Universe.